Description: Parsnips are another root vegetable that bears many similarities to the very popular root veggie carrots. 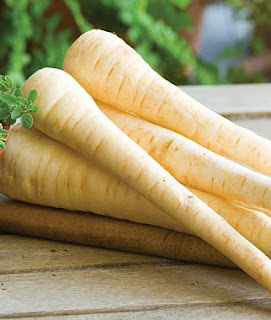 Parsnips, which are typically a light cream color are said to be sweeter in taste than carrots. While often cooked parsnips can be eaten raw as well, although only the root is edible as parsnips produce a sap that is toxic making gardeners handle with care when touching the leaves. Despite the toxic sap parsnips are very easy to grow and its flavor is well-liked and even parsnip wine is very popular in some areas today.. Kitchen Pharmacy: Parsnips have proven to have many health benefits and are believed to hold anti-cancer propoerties, being especially helpful in protecting you against colon cancer and acute lymphoblastic leukemia. In addition they are anti-fungal and have shown to promote good hearth rate and lower blood pressure.